Buy wild salmon. Go for the best you can find/afford. Fresh is better than frozen and will have a firmer texture. Frozen is okay if you can’t get fresh. Choose salmon that is fresh from the seafood counter and not wrapped in plastic. It should smell slightly sweet, and salty like sea air. Choose center cut fillets (pieces will be thicker and harder to over cook) as opposed to tails. How much do you need? We usually allow 6 ounces per person. Download the Monterey Bay Aquarium Seafood Watch app to your smartphone. A fantastic resource, you can checkout their recommendations on the go– at the market or deciding what to order at your favorite restaurant. Drizzle salmon with olive oil and coat on all sides. Season the salmon with salt and pepper and set aside to come to room temperature, 20 minutes. Transfer salmon to a sheet pan lined with foil. 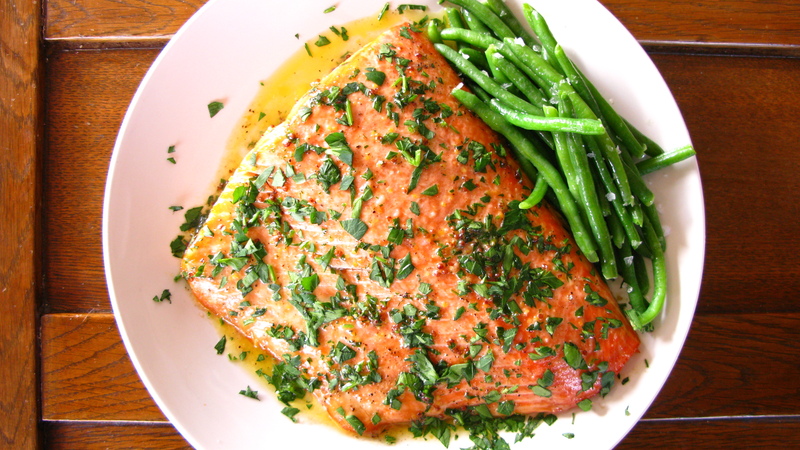 Place salmon in oven and roast until cooked, about 10 minutes. 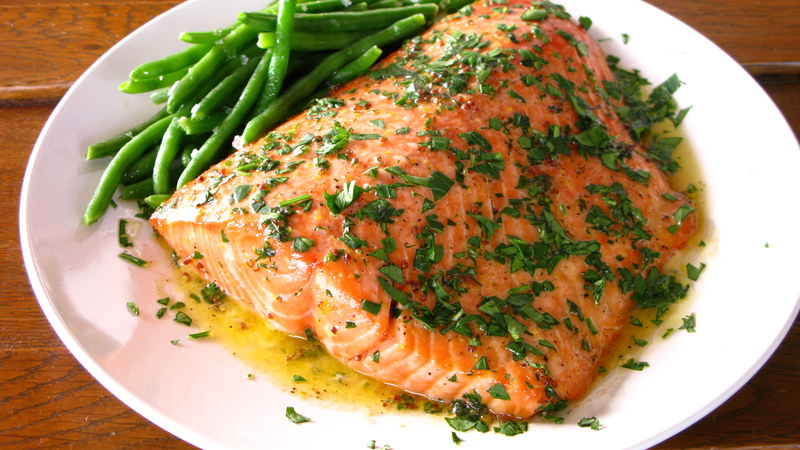 Remove salmon from the oven and while still hot, spread 2 tablespoons of butter over the salmon. The butter will melt creating a simple sauce. Sprinkle with parsley and serve. Looking for some flavor ideas to go with that salmon? Hit the thumbnail to jump to a technique video for inspiration!